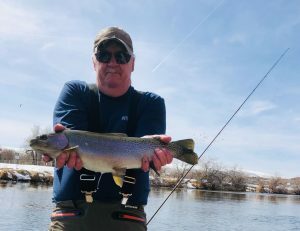 Bighorn River Fishing News Spring Flush: Many people have been wondering if there will be a spring flush on the Bighorn River in Thermopolis, Wyoming this year. Unfortunately, there will not be a spring flush this March. According to the Bureau of Reclamation, there is not enough inflow to conduct the spring flush this year unless we receive a lot more moisture in the next week. The Bureau of Rec. is looking at bumping flows the first part of May to 2100-2200 until the spring runoff is over. We had enough “flushing” or big water the past few years. A normal water year looks to be the case. Join us for a fishing adventure in Wyoming, send us an email or give us a call. Just click on CONTACT PAGE and give us a shout.